Code Geass is one of the most popular and highly acclaimed anime of the last decade. Its recently completed interquel, Akito the Exiled, is a different type of war story, but one that expands the anime’s complex look at morality in its mecha-filled world. Akito the Exiled is a theatrically released set of five hour-long films taking place between the first and second season of Code Geass. Instead of focusing on Brittania and Japan, the series focuses on the world’s other major power, the EU. Yet, in Akito the Exiled we see that while the EU is powerful, the rich have become as corrupt as the nobles they exiled hundreds of years before. Refugees, like the Japanese, are kept in ghettos and only freed if a family member joins the army and dies in battle. Thus, the new EU aristocracy is safe to throw lavish balls while foreign refugees die en masse to protect them. Of course, that doesn’t mean that everyone is corrupt. Akito the Exiled follows the titular Akito—a Japanese refugee mecha pilot—and Leila—the teenage daughter of Brittanian defectors as well as Akito’s commanding officer. Overseeing a team of scientists, Leila has developed strategies to use rockets and orbital drops to put specially designed mecha far behind enemy lines. Unfortunately, as the regular army is loath to do any actual fighting and play its part in her plans, Leila’s missions often end with an absurdly high casualty rate among her Japanese refugee squad—eventually leaving Akito as the only survivor. Soon, a group of Japanese terrorist youths are conscripted into her unit and Leila tries in earnest to not only earn their trust but keep them alive as they are sent on what are essentially suicide missions. On the other side of the story, Akito struggles with the fact that he is under the control of a Geass—the command to die. What’s interesting about this command is that, like Suzaku’s “live” command in the TV series, Akito has perverted the “die” command to a point where it is nearly a superpower. We see in episode one of the TV series that a Geass can easily make people kill themselves. But Akito the Exiled asks the question of what happens when you tell a small child to die? Even at the age where children can talk, most can’t understand the concept of death. Because of this, Akito is able to interpret the command in odd ways as he grows—i.e., he brings death to others instead of himself. The interaction between Leila and Akito is therefore one of life versus death as Leila tries to keep everyone alive and Akito is consumed with the need to slaughter on the battlefield—no matter the cost to the team. Yet, despite being opposites, the two work well together and find themselves drawn to each other and wish to understand the other’s way of viewing the world. As the main plot moves forward, we see what has become of Lelouch and Suzaku in the first few months of the missing year between the first and second season of the TV anime. 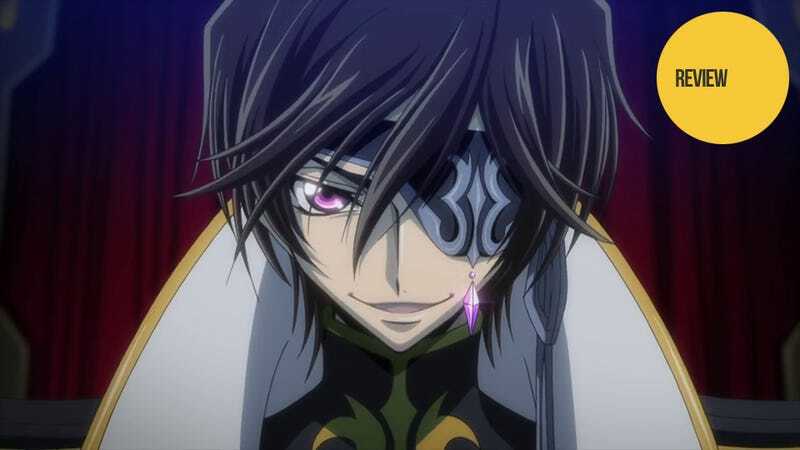 Rather than being sent directly back to his old, normal life as we were led to believe, Lelouch has instead had his memories altered such that he believes he is Brittania’s greatest tactician—with Suzaku as his bodyguard. During the day, he leads the conquest of Europe for the man he hates. Then at night he suffers like a man in the desert dying of thirst while Suzaku watches his former friend with a hateful glare. Unfortunately, it is a plot that ultimately goes nowhere and could be cut completely with little effect on the overall story. While Lelouch succeeds in throwing the EU into chaos with terrorist tactics, what he doesn’t expect is someone else taking up the “Zero”-type role of savior and rallying the common man to counter his campaign of terror. Then, thanks to a coup by the series’ main villain, Lelouch and Suzaku spend the last chunk of the series in a cell, effecting nothing (though there is at least one great character moment for the two near the end). The other problematic part of Akito the Exiled are the mecha themselves. Other than Suzaku’s Lancelot mecha and other rare prototypes, mecha in Code Geass are fairly elementary—they basically move like giant humans on roller skates. But Akito the Exiled has transforming mecha on both sides, with spider-like ones on the EU side and centaur-like ones on the Brittania side. Likewise the battles are so flashy with mecha doing wall-runs and backflips, that they seem more than a little out of place in the world of Code Geass as we have come to know it. That’s not to say, however, that the mecha designs and the battles themselves aren’t eye candy to the extreme. When taken as a whole, Akito the Exiled is a comparison piece between Leila and Lelouch and how each handle power and view themselves in their respective series. As a baseline, Leila and Lelouch share similar histories. Both are Brittanian nobility, both had a parent (or two) murdered, and both were raised in hiding under a false identity. With similar starts in life, it is no surprise that C.C. gave both of them Geass powers. After all, over the course of both Code Geass and Akito the Exiled, we see that Geass are given to inherently selfish people. We see Geass powers bestowed on those who have a goal, want, or need for personal gain—be that revenge, love, or something similar. What C.C. never could have guessed was that the girl with the murdered parents, freezing to death in the woods, would turn out to be a selfless individual. To put it another way, Leila’s story is what would happen if a selfless person like Euphie or Nunally had a Geass. What happens is somewhat obvious: Leila never uses it for personal gain—only to help others. Over the course of his tale, Lelouch betrays one friend after another—and eventually his own beloved sister. Leila betrays no one and always believes in people. Both Leila and Lelouch find themselves as symbolic leaders. Both are “killed” and have a chance for resurrection—to rise to power again. But while Lelouch takes this chance, Leila rejects it. And in the end, Lelouch becomes the ultimate villain, butchers millions, and dies to bring a lasting peace to the world. Leila chooses the path he couldn’t—the path Nunally always wished for her and her brother: a happy, simple life in obscurity with those she cares about. So while Leila doesn’t save the world, she does manage to save all those in her little corner of it, and she brings them the happiness that Lelouch could not for his own loved ones. In a lot of ways, Akito the Exiled feels like a story far removed from Code Geass as we’ve seen it before—though this is for the best. Instead of simply retreading the themes and plots found in the TV anime, Akito the Exiled plays as a companion piece. It has solid characters, great mecha action, and it expands the fictional world. But more than that, it enhances the themes of the original through its lead character, adding yet another layer to the complex morality play that is Code Geass. The final Akito the Exiled film (Code Geass: Akito the Exiled: To Beloved One) was released in Japanese theaters on February 6, 2016. The series of films have been licensed for release in the West by Funimation (and the Japanese Blu-rays come with English subtitles).